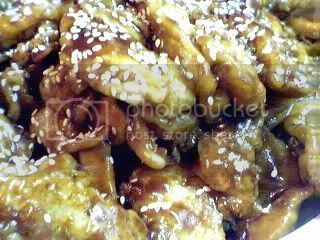 Another favorite at the Chinese restaurant, here is our version of Sesame Chicken. Combine the ingredients for the batter mixture and whisk until blended. Let stand for 15 minutes. In the meantime, heat the oil in a wok or skillet and heat until it reaches 375 degrees F. Dip the chicken strips in the batter and drop in the hot oil one strip at a time. Don’t over crowd, you may have to fry the chicken in 4 batches. Fry the chicken strips until they are golden and drain on paper towel. After frying, remove all the oil from the wok, but don’t wash. Return to the heat and add all the sauce ingredients, previously mixed together. Cook and stir until the mixture boils and simmer for 3 minutes until the sauce is thickened. Add the fried chicken strips and stir to coat with the sauce. Transfer to a serving platter and sprinkle with sesame seeds. LOL! Thess, tunay, ako din nagtagal, pero pagbigyan na nga natin 🙂 syempre, hindi naman kita puwedeng i-ban. Hindi ko pa alam gawin yon eh, ha!ha! Hirap palabasing ng mai-ge ang pix, pero nasarapan talaga ang mga bata. Buti na lang, para hindi kami lagi sa resto, ka gastos, eh! seriously, all I wanted to say was: I love the chicken w/ sesame oil and seeds combination! This blog is one of the coolest I’ve seen tonight! It’s not quite as cool as mine, but nearly. Not only are you providing a service by posting recipes for people, you’re also doing it in an organized and user-friendly manner.